I’m a little behind the times here, but I wanted to post a quick review of a mobile game I’ve been playing lately. Until I downloaded Sorcery! (whole other story, fantastic game) I was pretty engrossed in Fallout Shelter; the promotional tie-in to Fallout 4. The gist is that you take on the role of Overseer and look after a vault of post-nuclear survivors. 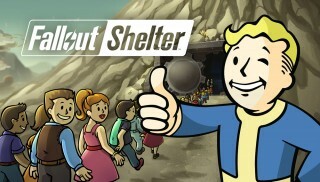 The art style of the game perfectly captures the tongue-in-cheek vibe of Fallout, based on the art seen in the menus of the first (and subsequent) games. The sound supports it nicely with little daytime TV style riffs. Edit: the game has just been updated, so I’ll tell you about those updates at the end.